Market - Eric D. Brown, D.Sc. This is a cross-post from Trade The Sentiment. On April 23 2013, the Associated Press reportedly had their Twitter account hacked. About 2 minutes after this Tweet was sent, the Stock Market saw a sell-off. According to my Tradestation Charts, the selloff began 2 minutes after the Tweet was sent. The Selloff took the S&P500 E-Mini futures contract down about 16 points within 2 to 3 minutes and then within 6 minutes of that tweet, the markets rebounded to levels before the tweet was sent. A chart of the S&P500 SPY ETF is below for reference. While this selloff was happening and throughout the rest of the day, many traders on Twitter were very adamant that this sell-off was the fault of “algorithms” that are listening to Twitter. These algo’s ‘heard’ the bad news from the AP Tweet and started selling and/or removing orders from the market, which caused the selloff that we say. Additionally, many people are blaming this selloff on High Frequency Trading (HFT). Without going into too much detail, HFT can be described simply as trading that is done solely by computers where trades last only minutes or seconds. This is a very very naive description but for the purposes here, it will work. Many people are arguing on Twitter that this is a failure of Twitter security or that Twitter caused this crash. I disagree wholeheartedly. This was caused by human error. The security of the Twitter account isn’t really at issue…the AP have claimed that the hack came via a Phishing attempt. If Twitter had Two-Factor authentication, perhaps the AP account wouldn’t have been hacked…but you can’t blame Twitter because the AP folks were fooled by a decent Phishing attempt. I digress though…this isn’t a post about Twitter Security. It’s a commentary on the “Twitter caused the markets to crash” mentality that is pervasive on Twitter right now. People are arguing that the crash is the fault of Twitter and the “algo’s”. But…what should have the reaction been to news of an explosion and injury to the President of the US? Should it have been ignored? No…it shouldn’t have. It was news that SHOULD have driven the markets…and it did. Sure…the speed at which the markets crashed might have been helped / driven by the HFT algo’s but I’d argue that this same news event would have caused a very similar action before HFT’s existed. Imagine the Pit back in the days of manual Pit trading. If News had broke that the President had been injured in an explosion at the White House, wouldn’t the same movement have occurred? Perhaps it wouldn’t have been as fast but it would happen. For example – look at what happened when President Kennedy was assassinated….the Dow fell 3% that day after the news. Within a week, the markets had recovered that loss. (source: The Stock Market’s Response to Dramatic Historical Events). What we saw on April 23 was an event at a smaller scale but much faster. So…did Twitter crash the markets? Traders were trading the markets. Just like they always do. Sure…they may have been using technology to trade this news much faster than they used to be able to…but…this type of news is the type of news that should cause the markets to move. Are there things that could be done better in the future to keep this type of event from happening? Sure. Take a look at Nanex and what they are doing on the HFT front…they know that area backwards and forwards and based on their work, I believe there are many many changes that need to happen in the markets. That said…I don’t think the markets are “broken” because this happened. They may be broken for other reasons. I also don’t think Twitter “crashed” the markets. Blame what you will…algo’s and HFT’s may have caused the quick sell-off – but they were only acting in a way that they were told to act. 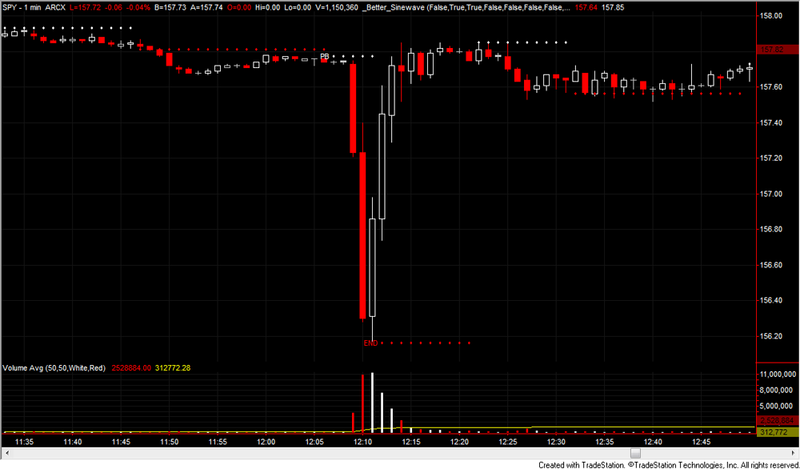 It could be argued that HFT’s / algo’s caused the immediate rebound too. The markets have always been news / event drive. This ‘event’ is no different. Horrible news came out from a trusted source. This news was acted upon in a manner that was consistent with the news. The reaction was faster than most people would have liked, but I don’t believe the reaction is any different than it would have been 20 years ago. It’s actually simple and straightforward – an event happened that *should* have caused the markets to drop…and they did. When it was determined that the event was false, the markets came back to where they were…as they should have. So…Twitter didn’t crash the markets. The markets reacted to news. Just like they always have. 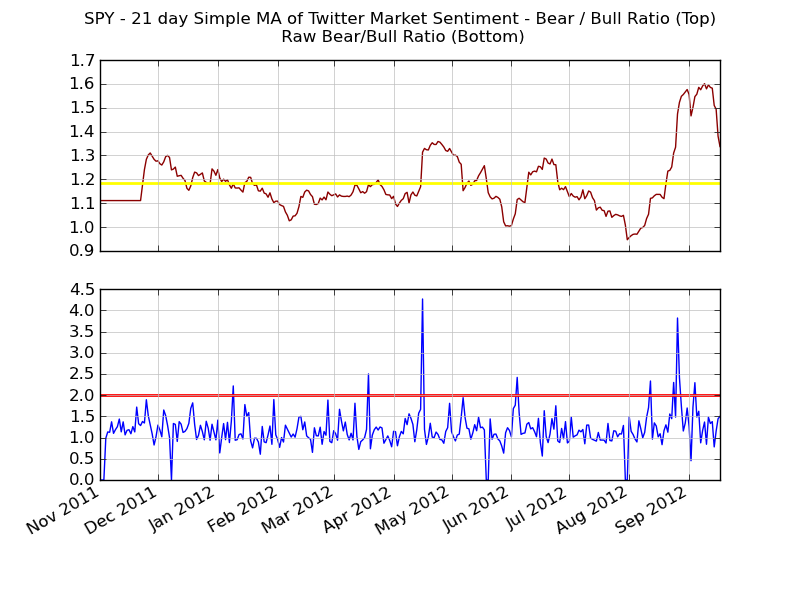 Can Twitter Sentiment be used to generate buy / sell signals? Before we get started…its VERY easy to look back and say “yes…that would have been a buy signal”. If the market worked with hindsight, we’d all be millionaires. For this approach, I’m going to use the thought that the masses are ‘wrong’. That is…when Sentiment gets extremely bearish or bullish, I’m going to go the opposite direction. If Extremely Bearish, I’m going Long. If Extremely Bullish, I’m going to short. Finding the “extreme” is going to be a very subjective approach. For the purposes of this study, I will use the Daily Bear / Bull Sentiment chart. When the sentiment spikes over a 2.0 (a level of 2.0 on the Bear / Bull chart means the sentiment is twice as bearish as bullish), I will go long. For this study, I apply this strategy to the S&P 500 ETF – SPY. An “extreme” is found in the Bear / Bull Daily Sentiment Chart. This is defined as any reading over 2.0. Long only. When an an extreme is found, I’m going to go Long the underlying stock at Market Open the next day. All orders will be entered as “market at open” orders. # of Shares = 500. Stop = $2 (trailing) (e.g., if entry is at $140.00, the stop is at $138.00 and it moves up as price moves up). If I am still in the trade upon a new extreme, no action is taken. With the above dates of extremes in mind, let’s take a look at how an investment strategy using these peaks would do. Extreme on Jan 9. On Jan 10, go long 500 shares at Market Open. SPY opened at 129.39. With slippage, Order is filled at 129.49. Stop set at 127.49. Trade lasts 13 days and closes on Jan 27 when Trailing stop is hit for a Gain of +$1.56 per share or 1.20% return on investment. Extreme on March 19. On March 20 2012, go long 500 shares at Market Open. SPY opened at $140.05. With slippage, Order is filled at $140.15. Stop set at 138.15. Trade lasts 7 days and closes on March 28 when Trailing stop is hit for a Loss of $0.51 per share or a total return of -0.39% return on investment. Extreme on April 16. On April 17 2012, go long 500 shares at Market Open. SPY opened at $137.94. With slippage, Order is filled at $137.94. Stop set at 135.94. Trade lasts 5 days and closes on April 23 when Trailing stop is hit for a Loss of $1.41 per share or a total return of-1.09% return on investment. Extreme on June 4. On June 5 2012, go long 500 shares at Market Open. SPY opened at $127.85. With slippage, Order is filled at $127.95. Stop set at 125.95. Trade lasts 4 days and closes on June 8 when Trailing stop is hit for a Gain of $3.42 per share or a total return of 2.64% return on investment. Extreme on August 12. On August 13 2012, go long 500 shares at Market Open. SPY opened at $140.70. With slippage, Order is filled at $140.80. Stop set at 138.80. Trade hasn’t closed yet as stop hasn’t been hit. As of Sept 18, SPY closing price is $146.49. Stop is at $144.94. Current Gain of $4.14 per share or 3.2% return on investment. No additional Trades taken since Trade #5 is still active. 5 trades, 5.56% return over 8 months. In the same timeframe, the SPY ETF, if you were to buy 500 shares of SPY on Jan 10 (the date of the first trade) at the same price of my purchase @ 129.49 and hold them without a stop you’d have a gain of $17.13 per share for a 13.23% return. That said…you would have also seen a pullback to below your entry point (low of 126.48 on June 4 2012). Would you have stayed in that trade if it had gone against you $3? Now…I’m not a “buy-and-hold” person. Too much stress. If I can make 5 trades with an average hold time of 11 days and pull out 5.56%, I’d be pretty happy. That said…if I changed my trailing stop from $2 to $5…the outcome would have been different. With a trailing stop of $5, this approach would have made 3 trades for a total gain of $25.15 or 19.42% return and an average of 39 days per trade. Not bad, eh? Now…this is by no means “proof” that sentiment can be used as a buy signal. During this uptrending market, I could probably have picked any day at random and run this same analysis and got similar results. But…you can say that about any strategy, no? Note: For those who point out that commissions aren’t included in this calculation, please note that a $50 charge for commissions ($10 per trade round-trip) will not significantly alter the outcome of this strategy. In the next few days/weeks I plan to share more of these ‘applications’…stay tuned. If you want to keep up with more of my market related topics, jump over to my Market focused blog at TradeTheSentiment.com.